Gay Paris, Gingerbread Men and an Egg! 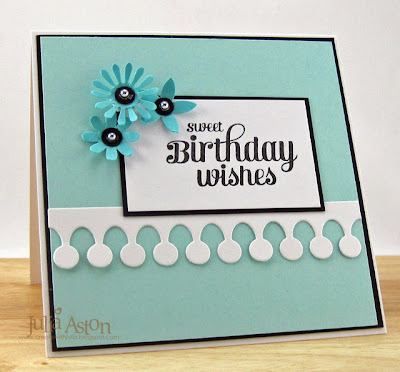 Today I'm sharing 3 cards I made for challenges this week over on Split Coast Stampers. This card was for the Tuesday Teapot Challenge - where the theme was Paris. I also used the Sketch from last week. My image stamps are Rubbernecker from the Paris 1908 Set and the sentiment is from the Floral Silhouette set. The pretty papers are from Pink Paislee Vogue Collage Paper Pak. My next card was made for the Clean and Simple Challenge where we had a lovely inspiration picture of pastel frosted cupcakes. 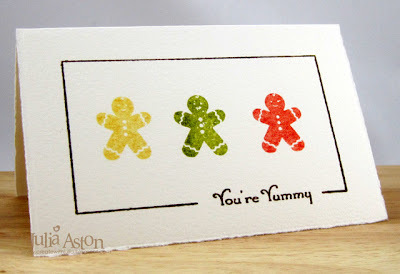 I used little gingerbread men and a sentiment from the Oven Fresh Gingerbread Joy set from Waltzingmouse instead of cupcakes, framing them with a line frame stamp from the Frame It set. I used a Fabriano card that has a distressed edge and is textured almost like watercolor paper. 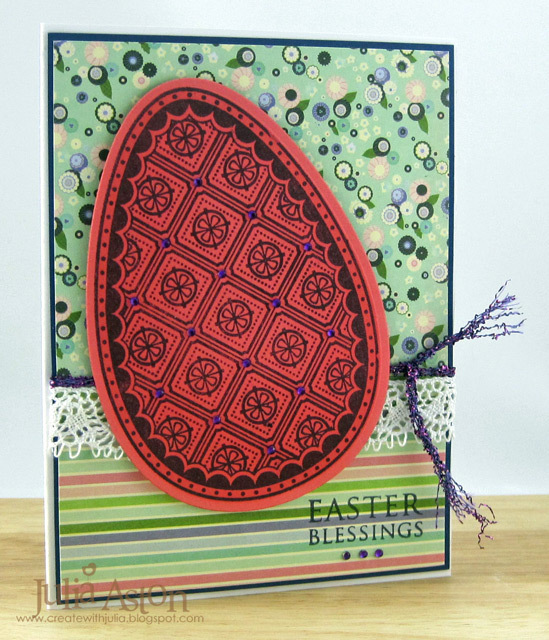 This beautiful egg is from Nestie Eggs from Waltzingmouse and the papers are Pink Paislee Vogue Collage Paper Pack. I'll be back on Sunday with my card for the Sunday Stampin Sisterhood challenge - hope you'll check back then and join in on the challenge! AND Jacquie has extended the deadline fo the stampin Sisterhood Mother's Day blog hop to tonight (Friday) at midnight EST. So if you haven't hopped yet check it out here! There are stamps to be won! The winner will be announced Saturday at the Stampin' Sisterhood blog. My goodness - what a fun Try a New Technique challenge we had over at Split Coast this week! Faux Patina!! Have you tried this before??? Here's how I made mine based on Judy Rozema's instructions for the challenge. It looks like a lot of work - but it doesn't take much time at all. I listed the colors that I used - but you can use any combination you want! 1. I ran my River Rock ink pad over the inside cover of my Patchwork embossing folder, inserted my white card stock panel and embossed it. This colors the background of the embossed panel and not the pushed up parts (clean the ink off your folder as soon as you emboss the paper). 2. Next I sponged Taken With Teal Ink over the embossed panel. 3. Then I sponged Always Artichoke over the embossed panel. Sponging with all these colors gives a wonderful mix of color - you can see how it mixes as you go along so you can sponge more or less depending on how you want it to look! 5. I lightly brushed my embossing ink pad (Versamark) over the raised areas of the embossed panel, then I sprinkled the panel with gold embossing powder (you can use any color metallic embossing powder you want to). 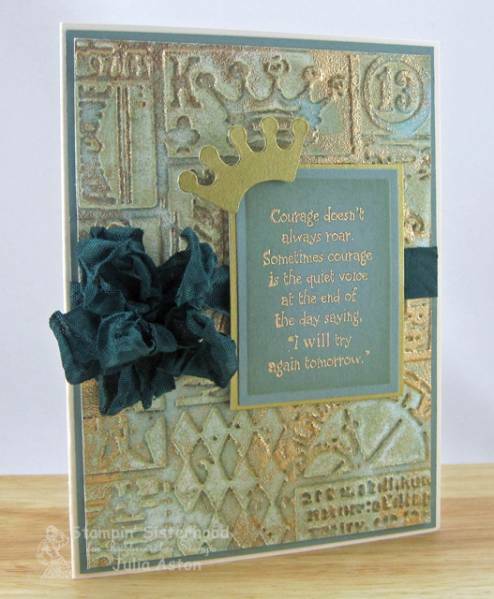 It will probably stick to most of the card - so brush off most of it with a cloth or brush (you only want the gold here and there) then emboss it with your hot gun. and you have a lovely faux patina! My Rubbernecker sentiment says "Courage doesn't always roar, sometimes courage is the quiet voice at the end of the day saying "I will try again tomorrow". " I gold embossed it on a piece of Ocean Tide card stock, cut it with a rectangle Nestability, sponged the edges with Bundled Sage before taking it out of the die and layered it to a gold card stock panel. The crown is from Heart & Wings Tim Holtz die. 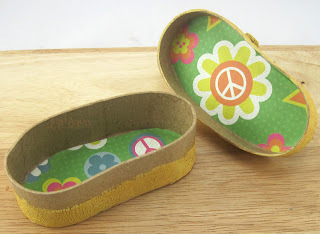 I buy my pretty wrinkled seam tape from Prairie Bird Boutique Etsy shop. Ink: versamark, River Rock, Taken with Teal, Always Artichoke - SU, Ranger Distress Bundled Sage. 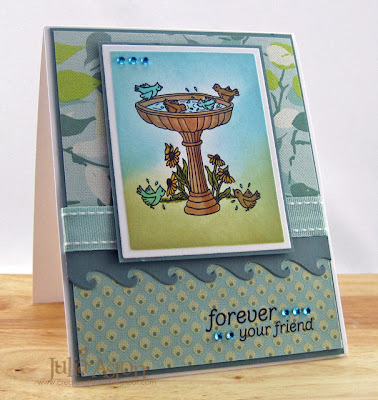 Since we've been having 80 degree weather in March here in Massachusetts - it seems perfectly normal to make a card with a summertime birdbath in it!! This pretty little birdbath is a digi image called Birdie Bathtime from Sweet 'n Sassy Stamps. I cut the image with a rectangle Nestability sponging the edges with Ranger Distress Tumbled Glass and Shabby Shutters before removing the image from the die. Then I colored the image with Copics. 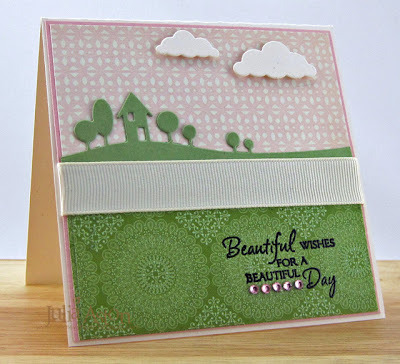 The pretty papers are Amy Butler by K& Co and the wave border is a die from MFT. 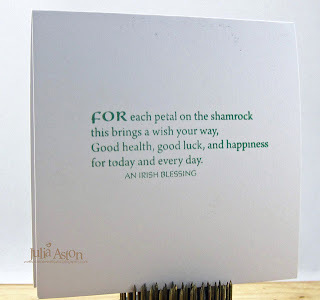 My sentiment is a rub on by Stampin' Up. Raise the Bar RTB97 In the Garden - to use an image of something you would see in a garden. SCS Queen for the Day - Korin was this weeks queen and I cased this card of hers. SCS Free 4 All challenge - to use 3 or more of something - I used 8 rhinestones! 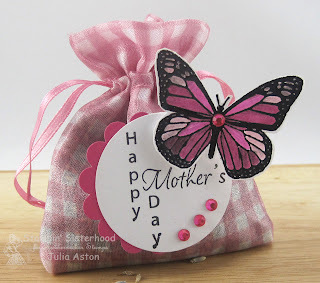 Welcome to the Stampin' Sisterhood Mother's Day Blog hop! Today we hope to inspire you with Mother's Day/Spring creations using stamps from Rubbernecker. We know we're a little early (Mother's Day in the US is May 13th this year) but we want you to be ready!!! 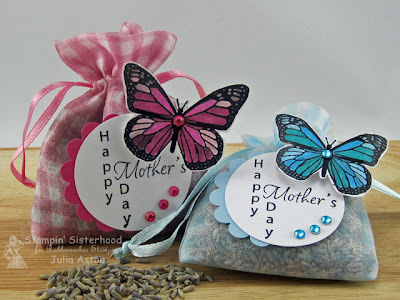 For my project, I made two little lavender sachets using these sweet 3"x4" organza gingham bags from Pouch Mart and some dried lavender that I purchased at Pickity Place (a garden shop). I embossed the butterflies in black and colored them with Copics. I stamped the sentiment punching it with a 1 3/4" circle and layering it off center to a punched scallop circle. 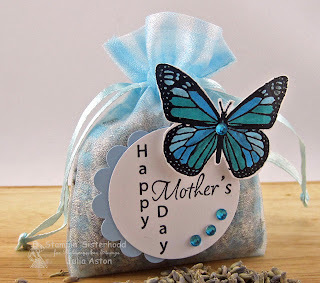 I adhered the sentiment to the bags with ScorTape to be sure it would stay on - and adhered the butterflies with a thick foam tape to add some dimension, curling the wings back a little around my finger. 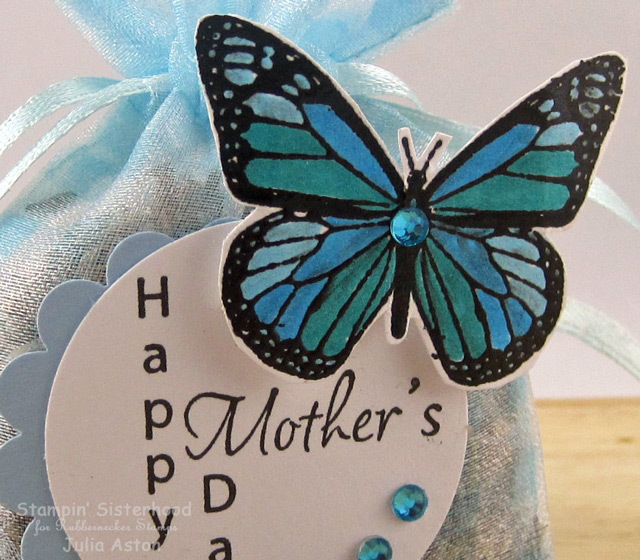 Then I added some rhinestones to the sentiment and the body of the butterflies. Wouldn't these be lovely to tuck in a drawer (wrap in tissue to protect clothes from possible oil seepage) or to hang in a closet to keep it fresh smelling! One lucky commenter will win a Stamp set of their choice! -Go back to the Sisterhood Blog and leave a comment there! Accessories: 3" x 4" organza gingham bags - Pouch Mart.com, circle and scallop circle punches - SU, rhinestones - Kaiser, Copics - B02, B05, BG49, RV04, RV17, RV21, dried lavender - from garden shop. Hi Stampers! As my title suggests - I have two things to share today - a pretty butterfly and lovely bird nest! 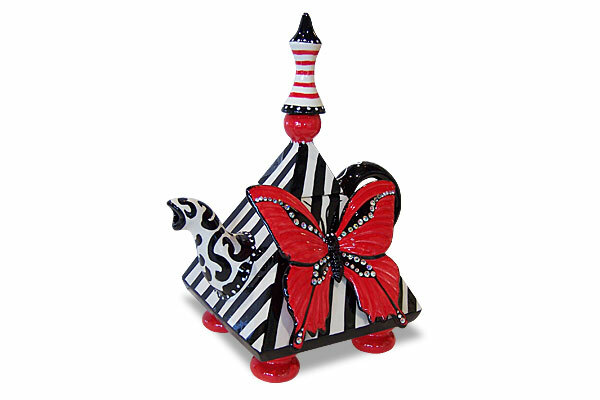 I made my butterfly card for the Split Coast Tuesday Teapot Challenge - this was the teapot Cindy wrote her story about. Funky huh?! 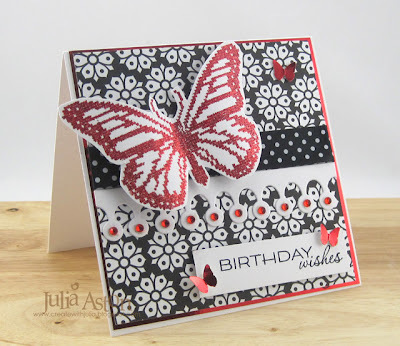 I embossed my lovely butterfly from Nordic Spring in Cherry Twinkle embossing powder by Judi Kins - something I recently bought and was perfect for this card - it is REALLY shiny IRL! I also used red metallic paper for my little baby butterflies. I really got carried away with the busy patterned paper and dotted ribbon but was totally inspired by Cindy's teapot! The sentiment is from Fancy Phrases by Waltzingmouse. 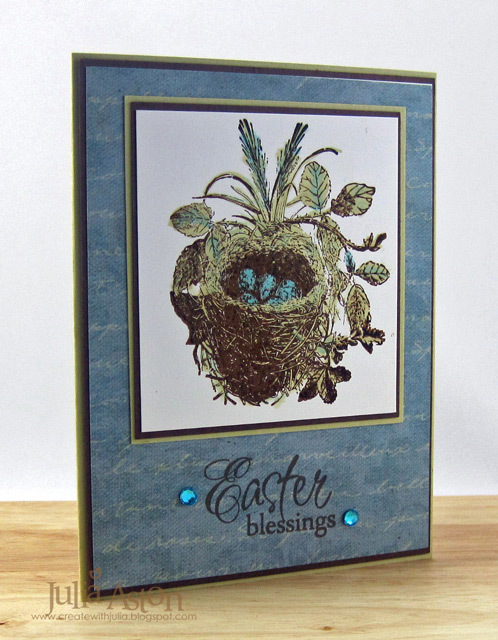 I stamped this wonderful LaBlanche stamp - Nest with Eggs - in Archival Coffee ink then colored it using Cut-n-Dry pen nibs and River Rock and Baja Breeze inks. LaBlanche stamps work best on LeBlanche paper. It's like glossy card stock - but not quite as glossy. 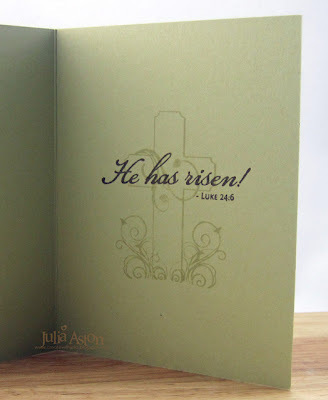 I stamped the Easter Blessings from Verve directly on the patterned paper with Archival Coffee Ink. My next card is ballet toe shoes! 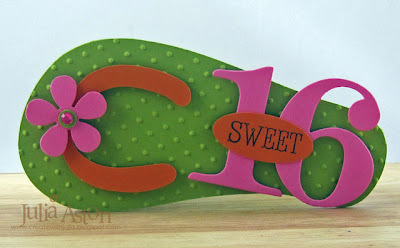 I created this card for a co-worker who wanted a 30th birthday card for her niece. The niece is a teacher but her passion is dancing. 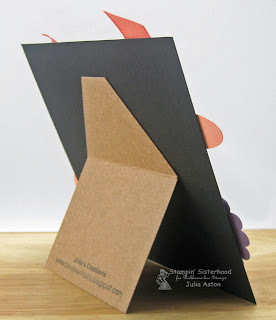 This card is 5"x5" and instead of having it open - I made an easel backing for it so it could be stood up and displayed. 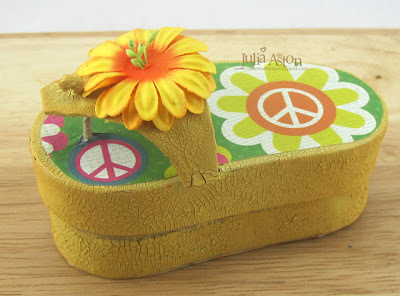 And my final shoe is another little flip flop - this time a box that I got at Michaels and painted with Scattered Straw Distress Crackle Paint. The same co-worker's sister is turning 60 and in true baby boomer fashion - she is a flower child/hippie! I found this perfect 'peace' patterened paper at Michaels. The bright daisy is Prima. 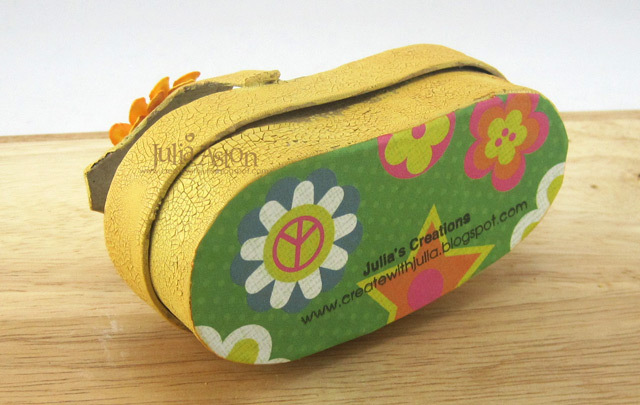 I also made a tag to go along with the flip flop box. I found the perfect sentiment for the flower child - "You Make Everything Groovy' by Verve (are you now humming Wild Thing??!! - you are if you are a baby booomer!!) I added the big numbers (dies from PTI) and two punched butterflies. I looped 3 colors of twine through the top. Here you can see how I lined the cover and inside bottom of the box - I just traced the box and cut it a little smaller. I think it adds a nice finishing touch. You may remember I made a high heel shoe a month or so ago - it was made for the same co-worker (another relative's 40th b'day) you can see that shoe on my post here. Ok - now let's all go shopping for some shoes!!! are you with me!?!?! Accessories: small oval punch - SU, flower punch - EK Success, rhinestones - Kaiser, Swiss Dot embossing folder - Provo Craft, number dies - PTI, foam tape, 1/4 hole punch - Fiskars, Silhouette Machine, flip flop template from Silhouette. 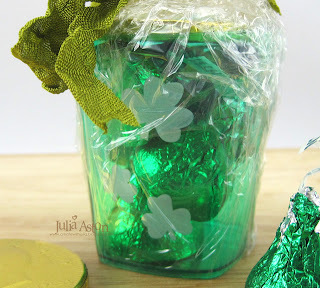 WMS Blog Party - St. Pat's/Irish/Green Theme! 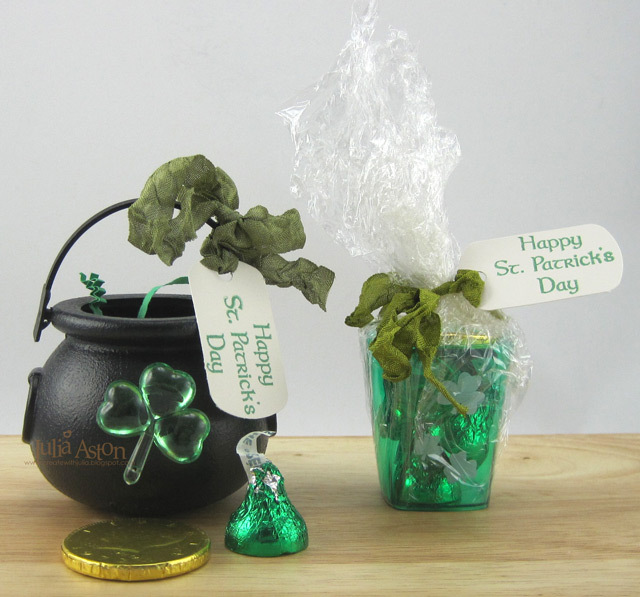 This month's theme is St. Pat's, Irish, or just green! I decorated a pretty green treat bag for my project today. 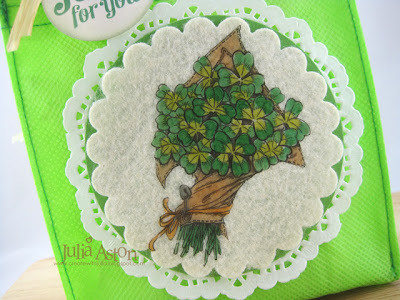 I used one of Claire's free digital Images - this pretty shamrock nosegay! I actually printed it on Graphix Rub Onz paper, colored it and created my own rub on to decorate my felt scallop Nestability Circle! The fun thing about a digital image is that you can size it to what your needs are. I found this lovely Oxalis plant at the supermarket - a perfect back drop for my little bag. The leaves look like giant shamrocks and there are beautiful little white flower clusters! and here's the inside of this one! 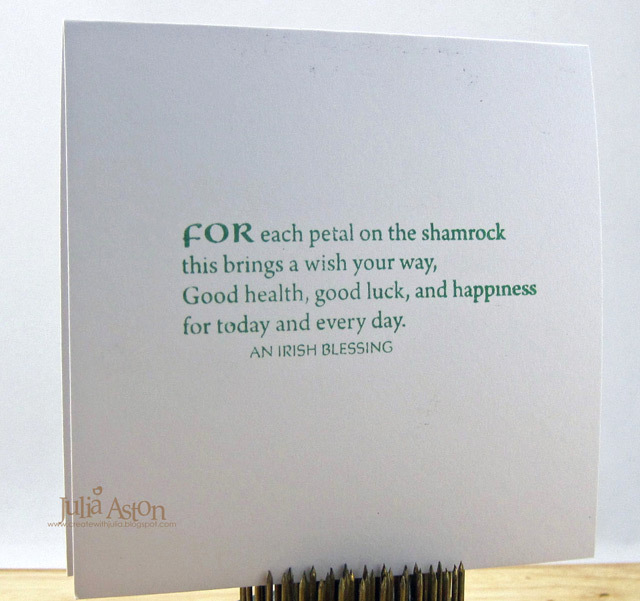 The 'happy' is from the set Celtic Heritage all the other stampings are from Irish Blessings. THE OFFICIAL THEME IS ST. PATRICK'S DAY/IRISH/GREEN. The choice is yours because we realize that not everyone gets as excited about St. Patrick's Day as we do. So if shamrocks and Celtic designs aren't your thing, just make something green! Please feel free to play off the green suggestion…green could be a color scheme or using something recycled. Just remember to use your Waltzingmouse Images. It will work pretty much as it did last month; you will have a 24 hour window in which to post your direct links to your projects using the Inlinkz tool that will be available to you right here on the 17th. Below is the schedule of beginning and end times in which you can enter your direct link to your project. Just find your general location and go from there. All the details and the link up are on the Waltzingmouse Blog - show us your GREEN!! 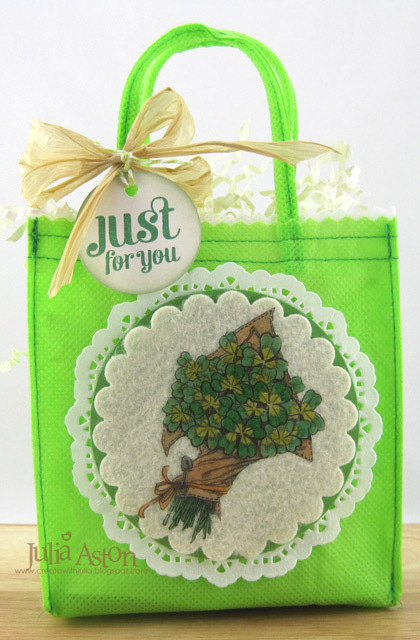 Stamps: Waltzingmouse - Free Digital Image Shamrock Nosegay, sentiment from Compact Sentiments Set. Paper:; Vintage Cream, New Leaf - PTI, Paper doily - Yellow Bicycle, Graphix Rub Onz Paper. Ink: Memento Cottage Ivy, Ranger Distress Bundled Sage. Accessories: Copics - G28, YG95, YR02, T6, YR07, 5.5 x 5 green bag and Raffia - Pouch Mart.com, 1 3/4" circle punch - SU, scallop circle and circle Nestabilities, Honey dew bakers twine - the Twinery, Cropadile. 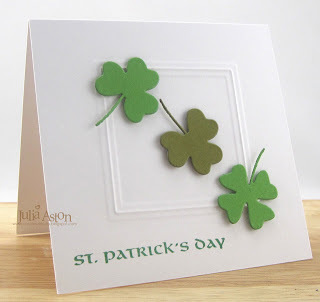 I have 4 cards to share with you today - all made for challenges over at Split Coast Stampers. My first card was for this weeks Color Challenge where hostess Mary asked us to use yellow, poppy parade and pool party. 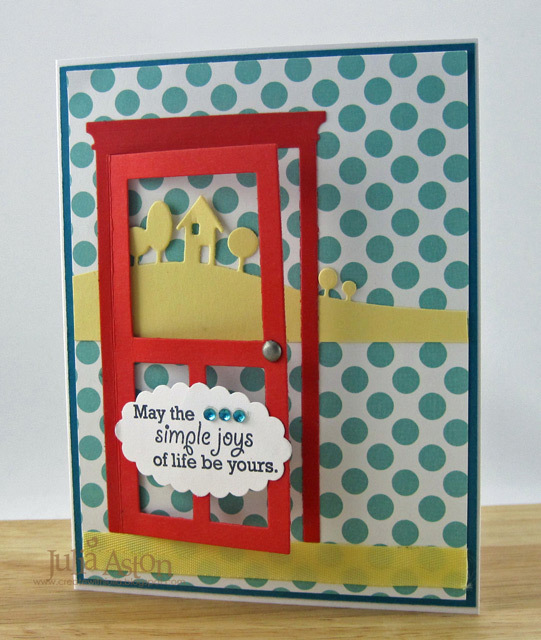 This fun summer screen door from Poppy Stamps reminds me of the simple joys of a hot summer growing up - running in and out of the house through the back screen wooden door and hearing it slam! The modern landscape die is Memory Box. I added a little brad for the door handle and a strip of twill ribbon to ground the door. I love how the door cuts open - welcoming us into the summer sunshine! The sentiment is from Green Thumb by Papertrey Ink. 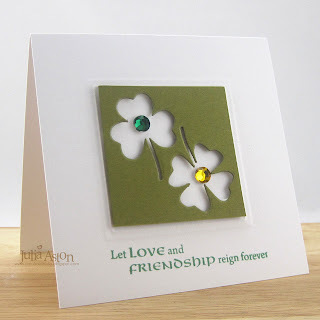 For card #2 I used the same landscape die for this Color Challenge card from last week. Hostess Karen asked us to use Vanilla, Wild Wasabi and Blushing Bride - and for dessert - to do some heat embossing! I created a little country scene with rolling hills and fluffy white clouds to illustrate the beautiful day spoken of in the black embossed sentiment by Rubbernecker I added a row of pink rhinestones for a little shimmer! 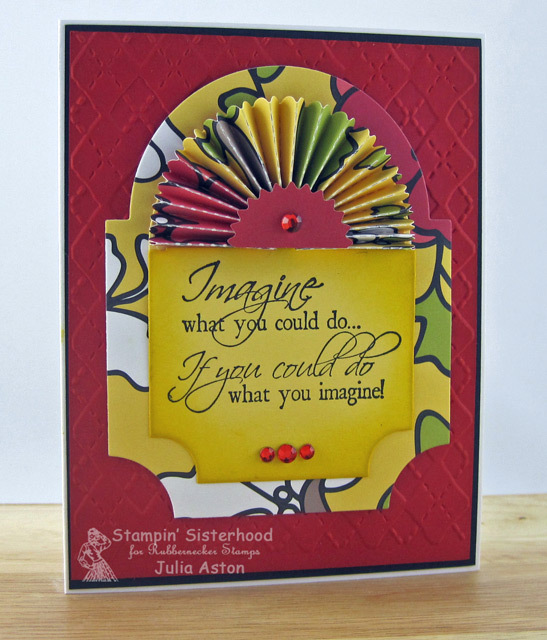 This next card was made for the Inspiration Challenge as well as the Free 4 All challenge - to use a fan fold. 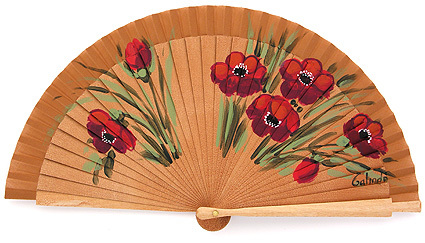 Anne had a wonderful decorative fan web site to show us. I was inspired by this pretty flowered one. It reminded me of some patterned paper I had in my stash by American Crafts. I made a little fan out of the paper using my Tim Holtz Rosette die and adhered it to the top of my Mat Stack 3 die from PTI. I stamped my sentiment from Rubbernecker on the bottom part of the Mat Stack and layered it to the next size larger Mat that I cut from the same patterned paper. 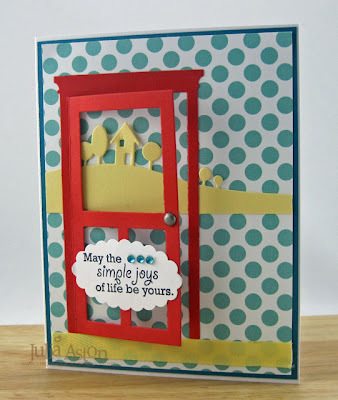 I embossed the red panel with Argyle and sponged the sentiment Mat with Mustard Seed Distress ink. I added some rhinestones to finish it off. And my final card for today was made for 4 challenges! Combining last Wednesday's sketch, Thursday's Ways to Use it (something a boy would play with) and two from Thursday - the Free4all to use a fan fold and The Queen for today - Neva. I was inspired by the cute cowboy on this card of Neva's and in true Neva fashion my card incorporates multiple challenges! My super hero is a digi imge from Mo's Digital Pencil called 'Ta Da' from the Super Kid set. My sentiment is from Half Pint Heroes by Waltzingmouse . I colored the image with Copics, die cut it with a circle Nestability, sponging it with Mustard Seed distress ink before taking it out of the die. I layered it to a pinking circle Nestability. I cut the red star patterned paper with Tim Holtz Rosette die and layered it over the bottom strip. The background is embossed with Square Lattice from SU. 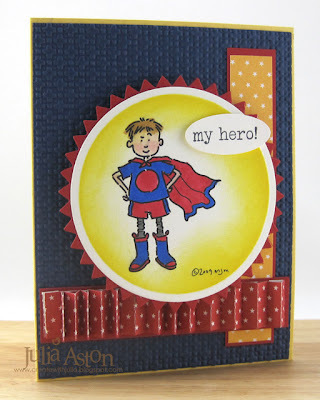 This will be a good card for one of my 'super hero' grand nephews! This month the theme is St. Patrick's/Irish/Green and to help you out if you have no appropriate images Claire has some free digi's here! You'll find all the party details here. 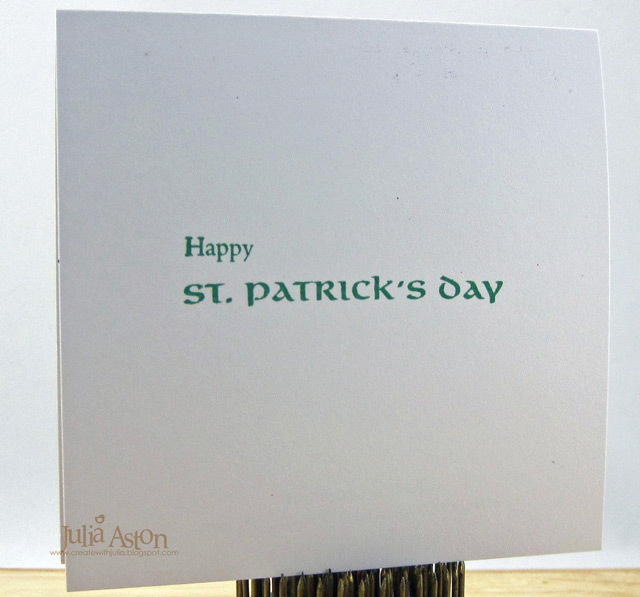 Two stamping friends and I had a St. Patrick's Day sale at our church this past Sunday and I wanted to share with you the things I made for it. I got these cute little black pots and shamrock shot glasses at my local Five Below Store. I dressed them up with a little tag and some wrinkled seam tape! 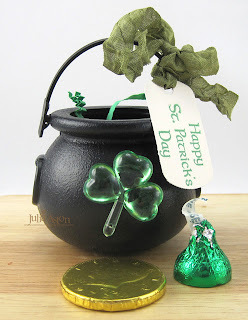 I stuck the plastic shamrocks (also from Five Below) on the pots with a glue dot. I filled both with Creme de menthe Hershey Kisses (special for St. Pat's day) and Chocolate Gold coins (found both at Target - I had trouble finding ANY St. Pat's candy items - the stores have all had Easter candy out since just after Valentine's Day!). You can see the white shamrocks on the shot glasses a little better in this close up! And I made some cards - this one uses the Tim Holtz Embossing Folder called Bricked. 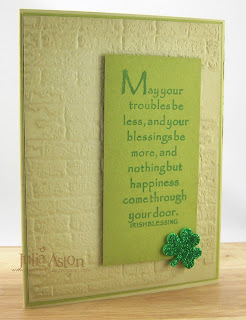 The stamps are all from a set called Irish Blessings from My Sentiments Exactly. The little foam shamrocks are from Michaels. Clean and simple and easy to duplicate! Entering these in the following challenges! Hello Stampin' Sisters! 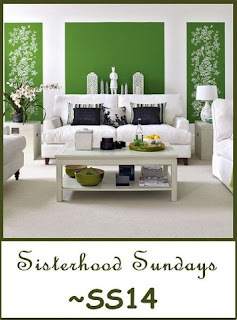 It's Sunday and time for another Sisterhood Sunday challenge! I used the inspiration picture as a sketch as well - using the colors and drawing from some of the design! I white embossed the lovely Rubbernecker Dark Garden Panel #542 on New Leaf card stock - cut two panels from it for each side of my card. For the touch of black - I die cut a Fancy Tags 2 out of Black Tie Bazzill (it has a little texture and a little shine!) 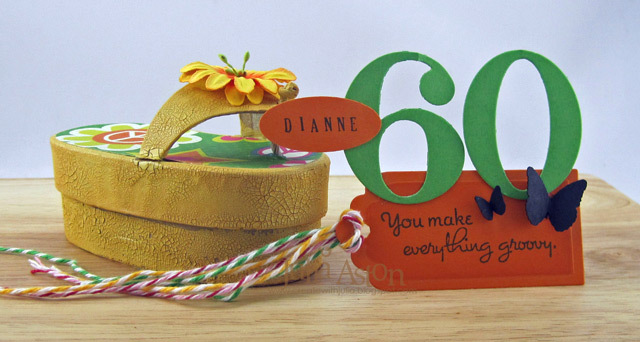 I stamped the Thinking of You #565-10 on white and die cut it with a Petite Oval Nestability. Instead of yellow - I accented with a light orange in my wrinkled seam tape and rhinestones. 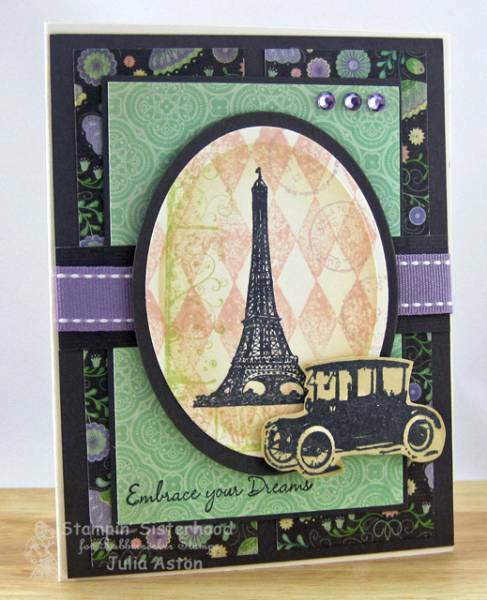 Please check out the Stampin' Sisterhood blog for all the details of the challenge and where you can link up your card - and see how you could win a free Rubbernecker stamp! I hope you'll join us this week for the Sisterhood Sunday Challenge! I'm also entering this in Cas-ual Friday - focus on the sentiment! Accessories: foam tape, rhinestones - Kaiser, wrinkled seam tape, white embossing powder, hot gun, Fancy Tags 2 Spellbinders, petite oval Nestabilities. It's the 10th of the month - so that means Lynn has posted the March Waltzingmouse Christmas Card Challenge in the Playroom of the WMS forum! 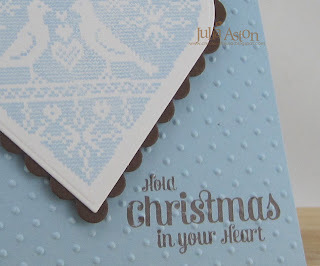 Her challenge for us this month is to use blue and brown - a rather non-traditional Christmas color combination! I went directly to two of Claire's February Release sets for my creation - Nordic Spring and Compact Sentiments. Well - the scallop heart is really cut from Dark Chocolate card stock but it's looking very black in this photo! This lovely Nodic style heart fits beautifully in the Nestability Heart die! I think you can see the true chocolate color a little better in this close-up!? I made 5 of these pretty cards for my 'pile' - I'll definitely be ready come December! Why don't you join along?!! You can check out all the details in the Christmas Card Challenge section of the Playroom in the Waltzingmouse Forum! And don't forget the March WMS Blog Party on the 17th! See all the details here on Claire's blog. The theme (appropriately enough!) is St. Patrick's Day/Irish/Green! No appropriate WMS St. Pat's or Green images? Claire has some free digital images here you could use for the blog party! So there's no excuse to not join in!!! Accessories: heart and scallop heart Nestabilities, swiss dots embossing folder - Provo Craft, foam tape. There's a Bunny in the Garden! Spring IS coming right??!! 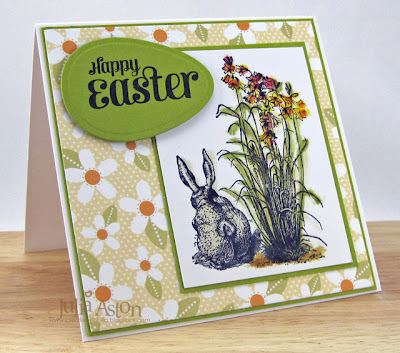 I made this sweet little Easter Card for the Featured Stamper challenge over on Split Coast this week. Kecia (LittleSeaOtter) was the FS and I chose her sweet Hide and Seek card to case. I used a different bunny stamp, different paper and sentiment - my bunny is from LaBlanche stamps. I stamped my sentiment from Waltzingmouse on a die cut Nestability egg and popped it up on foam tape. They recommend using LaBlanche paper to get the best impression with LaBlanche Stamps - it's like glossy paper but not quite as shiny. Just a reminder to check out to see if you were the winner of the Waltzingmouse Stamp Set of choice from the Design Team Blog Waltz on Wednesday - the announcement is on the Waltzingmouse Blog here. 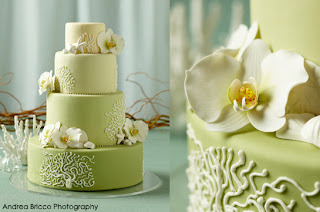 I was inspired by this beautifully elegant Beach Cake. And here's my rather Clean and Simple interpretation of it! The wonderful coral on the cake made me think of this lovely Arboscello Tree Die from Memory Box. First I stamped the sentiment from Compact Sentiments by WMS on the green panel. 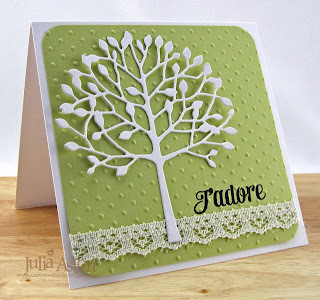 Then I embossed the panel with Swiss Dots, wrapped the simple lace around the base and adhered the die cut tree to the card. I used a glue pen and just glued the trunk up to the top - leaving the branches unglued so they lifted off the card a bit for a lovely 3D look. 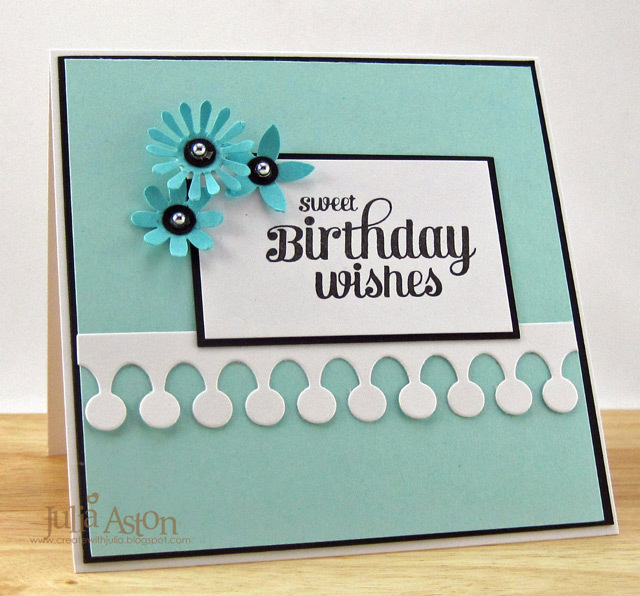 Inside I stamped - Bon Anniversaire - from the French Country set. So I will use this as an anniversary card. A little update on my cold - I finally slept in my own bed last night with two pillows so I was practically sitting up - but I slept from 10:30 pm to 4 am without waking up coughing! So I think I'm on the road to recovery - slow as it may be! Thank you SO much for all your supportive comments - I'm going to try and go to work tomorrow maybe just for half a day. 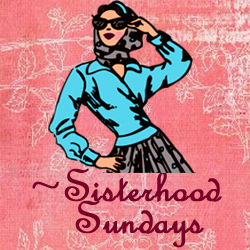 And don't forget to check out the Sunday Stampin' Sisterhood challenge! Accessories: 1/2" corner rounder - Zutter, Swiss Dots Embossing Folder - Provo Craft, Arboscello Tree Die - Memory Box, glue pen, lace. I made this card for two challenges today - The Free 4 All over on Split Coast was to use mostly blue and flowers - and the sketch is from Mojo Monday. 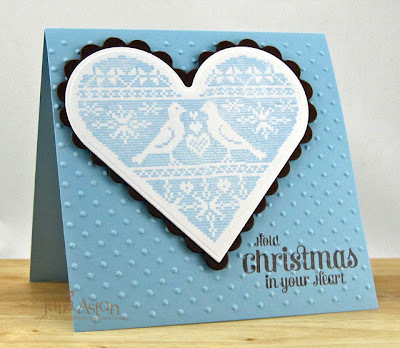 My sentiment is from one of the newly released sets from Waltzingmouse called Compact Sentiments. 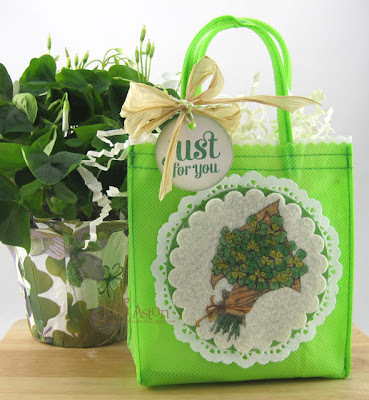 The flowers are from a Stampin' Up punch and the Monarch Border die is from MFT. I used my 1/4" hole punch for the black centers of the flowers - adding a silver pearl to each. One of the flowers is popped up on foam tape and I curled all the petals up a bit with my fingers. A short post for me today - I've been home sick all week with a terrible cough and chest cold - which despite having seen the doctor and taking prescription and over-the-counter medicines - still seems to persist! So I get up and do a little something - then drop back into the reclining chair - I can't lie down in bed or I'll have coughing fits! I hear this is going around a lot. I can't remember ever being this sick with a cold. I'd appreciate your 'get well prayers"!! 2. Sunday Stampin' Sisterhood challenge.